Volkswagen Motor Company, a German automaker, was founded in 1937. Under government orders, the young company was tasked with designing a car that could transport two adults and three children at more than 60 miles per hour. The so-called "People's Car" would be sold to German citizens at about the same price as a motorcycle. The result was the Volkswagen Beetle. The Beetle platform, with its characteristic rear-mounted, air-cooled engine, would eventually be used to develop other models including a van, pickup truck, and various sports cars. In the 1970s, Volkswagen developed front-engine water-cooled cars, like the Rabbit. This mode was the predecessor to the company's modern lineup. Today, the Volkswagen Group is among the world's largest automakers, with brands such as Audi, Bentley, Bugatti, Lamborghini, SEAT, Skoda, Volkswagen and, most recently, Porsche, under its corporate umbrella. Volkswagen manufactures a full range of passenger automobiles. The current lineup contains coupes, sedans, hatchbacks and sport utility vehicles with up-to-7-passenger seating capacities. Volkswagen vehicles run with gasoline, diesel and hybrid powerplants. Models include both front- and all-wheel drive. Volkswagen vehicles are manufactured and sold around the world. The Volkswagen Passat CC, or simply CC (as it is known in the United States), was first introduced for the 2009 model year at the 2008 North American International Auto Show in Detroit. The midsize CC is larger than the Golf and Jetta, but slightly smaller than the outgoing Passat. According to the automaker, CC stands for "Comfort Coupe," a reference to its 4-door coupe styling. Unlike the Passat sedan, its close platform-sharing sibling, the CC is only configured with a 4-passenger cabin. While the CC shares engines and transmissions with the family-oriented Passat, the CC has been engineered for a performance-minded customer; it is offered with a manual transmission or the automaker's 6-speed dual-clutch automatic. With just two years on the market, the CC is unchanged for the 2011 model year. The Volkswagen Eos is a compact retractable-hardtop convertible that first went on sale in 2007 as a replacement for the long-discontinued Rabbit Convertible/Cabriolet, and more recently retired Golf Cabrio. Built on the same platform the as the Volkswagen Golf, the Eos features a 5-piece, power-operated folding roof with an integrated sliding sunroof. With the top up, there is more than 10 cubic feet of trunk space and a hard roof over the occupants, according to Volkswagen. When the top is retracted (a process that takes about 25 seconds, VW says), trunk space drops to slightly more than 6 cubic feet. The Volkswagen Golf was first introduced in 1974 as a replacement for the original air-cooled Volkswagen Beetle. When it arrived in the United States, it was called the Rabbit-North America didn't receive the Golf nameplate until the second-generation model debuted in 1985.Now in its sixth generation and last redesigned for the 2009 model year, the Golf is sold in a variety of body styles, including 3-door hatchback and 4-door hatchback models. The current Golf is offered with a unique 5-cylinder gasoline engine, or a fuel-efficient 4-cylinder turbocharged diesel that delivers 42 mpg on the highway. All models are front-wheel drive. 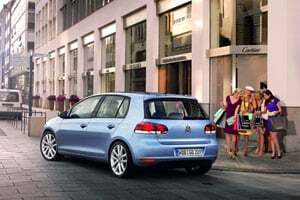 For the 2011 model year, Volkswagen has refreshed the Golf with a front-end design that includes a wide, double-bar grille that blends into angled halogen headlamps. There is a revised lower front fascia featuring a wide-mouthed cooling duct and new crystalline oval fog lamps (on TDI models). The window trim has been blacked out, and there is an absence of side moldings. At the rear, a hatch spoiler with integrated third brake light sits atop the decklid and is painted to match the rest of the body. The Golf also receives updated taillights and chrome exhaust tips. The Volkswagen GTI is a special performance-oriented version of the Volkswagen Golf. First introduced in the mid-1980s, the GTI model featured a slightly-more-powerful version of the 4-cylinder engine, upgraded suspension, upgraded brakes, larger wheels, and performance tires. The outside had a special paint job (black, red and white were part of the limited color palette), and unique interior upholstery and badging. The original GTI models were much more engaging to drive compared to their economy-oriented Golf siblings. Now, several generations later, the GTI retains its enthusiast mission. Upgraded features include a sport-tuned suspension, sport seats, leather steering wheel, alloy wheels, and a standard 200-horsepower, turbocharged 4-cylinder engine. New for 2011, Volkswagen has added to all GTI trim levels voice-controlled Bluetooth technology and 18-inch Detroit alloy wheels. Premium packages for the GTI now include the RNS 315 navigation system, Xenon headlamps with Adaptive Front Lighting (AFS), leather multi-function steering wheel, and the Dynaudio 300-watt audio package. The first Volkswagen Jetta debuted in 1979 when the automaker converted its Volkswagen Golf-a popular import hatchback-into a slightly roomier sedan. When it proved as acceptable as its sibling, the German automaker then offered the Jetta as a 2-door coupe, 4-door sedan, and as a 5-door station wagon in both front- and all-wheel-drive variants. Over its past five generations, the Jetta has been marketed as an entry-level luxury car, a sport sedan, and as an economy car (with both gasoline and diesel-powered powerplants). The Volkswagen Jetta is manufactured in five different countries and sold around the globe under such names as the Atlantic, Bora, Fox, Sagitar and Vento. The 2011 Volkswagen Jetta is an all-new sixth-generation model. Unlike its predecessors, the new Jetta is built on its own platform-meaning it does not rely on Golf architecture. As a result, the new sedan is 3.5 inches longer than last year's model. According to the automaker, this translates into more space and greater passenger comfort. Volkswagen launched its Type 2 "Microbus" in 1950, thereby demonstrating the convenience of carrying more than four passengers in a boxy, utilitarian-shaped vehicle. With the driver positioned over the front wheels, and the engine low in the rear of the chassis, the vehicle configurations were limitless. Over the years, Volkswagen's Microbus platform was built as a bus, camper, cargo van, pickup truck, and even as an emergency vehicle. The van withstood the test of time, and Volkswagen continued to evolve its design over the decades through the introduction of the Volkswagen Vanagon in 1979, and the Volkswagen Eurovan in 1990. While those vans have been long discontinued, Volkswagen chose to partner with the Chrysler Group and return to the segment in 2009. Volkswagen would design the interior and exterior, while Chrysler would supply the platform. The result was the Volkswagen Routan. The Volkswagen Routan shares the same platform and powerplants with the Dodge Grand Caravan and Chrysler Town & Country, and it is built in a North American assembly plant. New for 2011, Volkswagen has restyled the front and rear fascias and added new alloy wheel designs. Volkswagen launched the all-new Tiguan, a compact sport utility vehicle, in the summer of 2008 as a 2009 model. The 4-door followed in the steps of its larger sibling, the Volkswagen Touareg. While this meant that the automaker now had two SUVs in the marketplace, each one targeted a decidedly different audience. While the Touareg featured a standard, full-time all-wheel-drive system and an available air suspension giving it formidable off-road capabilities, the Tiguan offered a lighter chassis with a standard front-wheel-drive system (its optional all-wheel-drive system is designed to increase traction in inclement weather). With a standard, turbocharged, 2.0-liter 4-cylinder engine (borrowed from the Golf), the Tiguan also promised much better fuel economy than its heavier sibling. Designed to be sporty and fun-to-drive, Volkswagen calls the Tiguan ".the GTI of compact sport utility vehicles," a reference to its enthusiast-oriented GTI model. The 2011 Volkswagen Tiguan is a carryover. Introduced in 2003, and designed in conjunction with the Porsche Cayenne, the Volkswagen Touareg was the automaker's first SUV. The 5-seat Touareg delivered a blend of car-like handling and off-road performance despite its low stance, according to the manufacturer. The 2007 model year saw the return of the diesel-powered Touareg, with a 10-cylinder twin-turbocharged engine that delivered improved acceleration and fuel economy compared to its gasoline-powered counterparts. It's price-at the top of the Touareg model range-and the fact it wasn't 50-state emissions compliant led to its removal from the lineup. The Touareg received a significant update in 2008. The updates initiated a name change to differentiate the model from the prior years (it was now the "Touareg 2"). In 2009, Volkswagen reintroduced a diesel powerplant, with a smaller 3.0-liter V-6. The 2011 model year welcomes an all-new Touareg. Again sharing platform components with the Porsche Cayenne, the new model is several hundred pounds lighter than its predecessor-improving fuel economy, acceleration and handling, VW says. According to the automaker, the all-wheel-drive system is every bit as capable, but lighter and less complex. Volkswagen will offer the 2011 model with gasoline, diesel, and its first-ever hybrid powertrain.